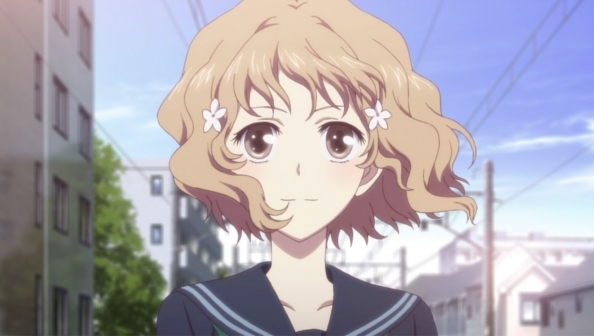 Hanasaku Iroha 26 has two main plot points to take care of: Ko, and what’s going to happen to Kissuiso? But, bah, plot. It’s the things around the often silly stories that make this show great, and the finale does not scimp. The show wastes no time in resetting the mood it established last week as the staff go to enjoy the bonbori festival. It’s a beautiful sequence. The art in this show was always great to look at, and it’s laced with scenes of the characters talking, doing festival things, thinking about their futures. The wish plaques give us a reprise of all the wish-talk from last episode. All of these scenes are humorous in that way that we can see an old friend doing something, and smile from memories. Not that these are throwaway scenes. 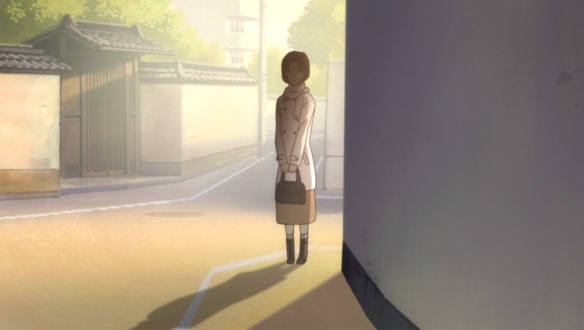 Sui learns that Ohana wants to be like her, and realizes that she hasn’t been walking alone all this time after all, though that thought had been brewing inside her for an episode or two. And it’s never said, but recent events have brought Sui and her daughter to, if not kinship, then more of an understanding. And we get plot point #1. I should probably care about it more than I do, if only for Ohana’s sake (This is one of those shows where I actually care about the characters), but I can’t help but feel that it didn’t matter if she wound up with Ko or not. Either way, she would move on. And Ko never struck me as the type of boy that a girl want to carry a torch for. Especially not after his last, indecisive, non-visit. On the other hand, maybe he needed the time get his feelings together, helped by the video he watched not long ago. And at the closing credits’ “what the characters did next” montage, where we see him waving to her on the way to school, both of them back in the city, I couldn’t help but feel happy for them both. The other thing that scene did was make me realize that Ohana’s time at Kissuiso was so brief, really, a blip in her lifespan. The second half is filled with goodbyes. A closing party. Kissuiso will be shut down but perhaps Enishi and Takako will reopen it. People leave. 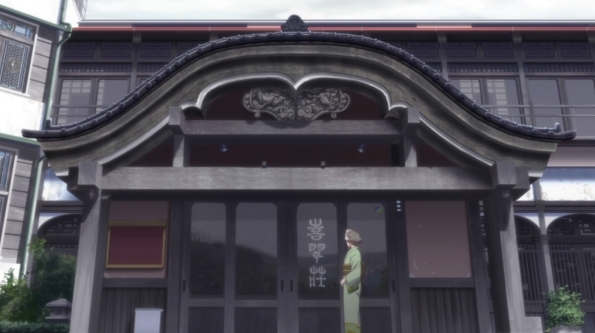 In a particularly moving scene, Sui walks through the inn she help to build and imagines it when it was open and lively, and then sees her late husband at the stairs. As usual, this show is too smart to get to maudlin, and the mood is broken when she hears Ohana, maybe her future self, shouting as she cleans the deck one more time. I say that the mood is broken, but the impact is just as strong. Madame Manager and her staff, with wish plaques. And that’s about it. A final goodbye between Sui and Ohana. We see the staff in the near future, and flashbacks while the credits roll. I watch it and think: apart from the inn closing down, nothing big happens, nothing that doesn’t happen to everyone in their lives. They find themselves here, they change a little, they change the place where they are a little, and they move on. This is uncommon enough in an anime series, but what really sets it apart is that there isn’t a weakly-drawn female character in it. Everyone from Ohana on down (or should that be up?) is an individual; what’s more, they are all strong women. How often do you see THAT in anime? As I said before, the show was always great to look at and smartly directed so that there’s a steady feel even in its most emotional moments. There were a few weak episodes, well, there was episode 3, but that one was still fun to watch. An excellent series. 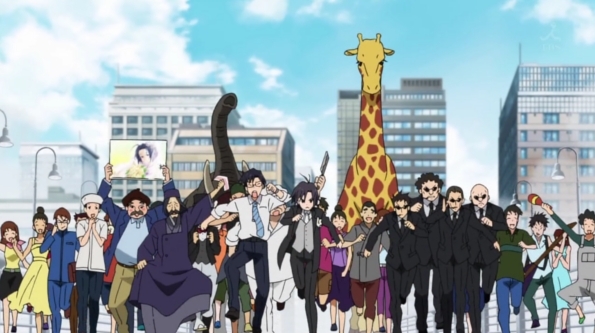 With this show gone along with Tiger and Bunny and Steins;Gate (and, I suppose, Nichijou, though it took me a while to warm to it), the fall season is going to feel empty. 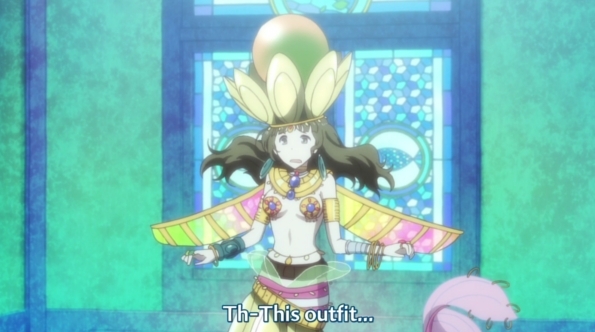 I suppose you could say we’ve started a new episode arc in Mawaru Penguindrum 10. 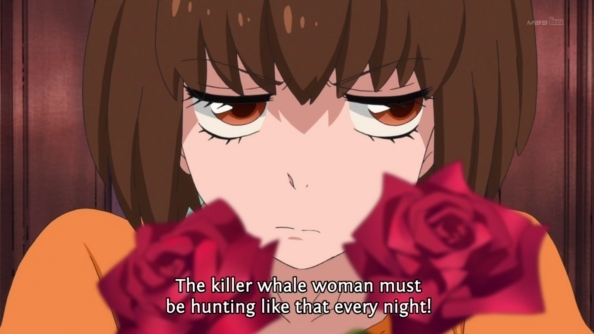 Though attention is paid to Ringo and her diary, focus shifts to Kanba and slingshot girl. But it doesn’t feel like a new arc, it feels like a variation on a theme: stalkers. But before we get to Slingshot Girl (whom I will call SG), let’s look at Ringo for a moment. She’s … normal. Maybe it was the shock of seeing Shouma hit by a car that snapped her out of it, but Keiji isn’t brought up once in this episode. Ringo worries about Shouma, feels guilty about what happened, and while she’s still possessive about the half-diary she has left she offers it freely when SG begins her “hunt” in order to save Shouma. 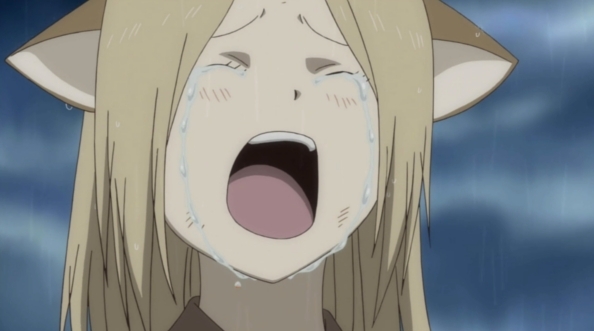 I hope this marks the end of Ringo’s story, or at least her obsession. Bad news for our heroes, though. SG is a much more formidable opponent, well, partly because she’s after Kanba. Soon, Shouma is drugged (again … the second time in three episodes he’s been face-down in his food) and kidnapped, and Kanba goes on a bizarre trek to rescue him. Earlier, Kanba had said too much to Himari about girls’ gifts he can’t stand, and now he’s confronted with everything he says. Cute bento, cakes, knitted sweaters … “Do you remember?” and you recall SG talking to other girls who had been spurned by Kanba. So is she taking it upon herself to get revenge for every heart he broke? Maybe. But when he reaches the basement, SG kisses him, and vanishes. So what exactly is her game? 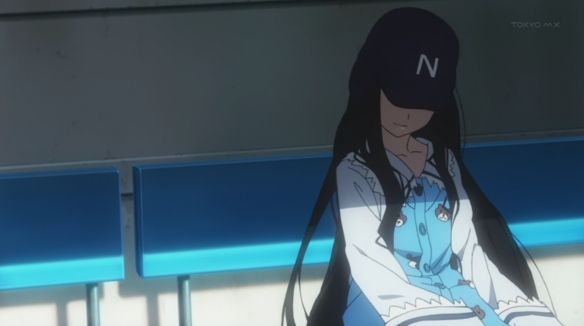 It’s further complicated when Himari, in Penguingirl mode appears to SG in the subway. Is she also in on this game? Is she taking a bit of revenge for the things Kanba said to her earlier, in spite of the fact that he blustered apologies the moment after? I don’t think so. 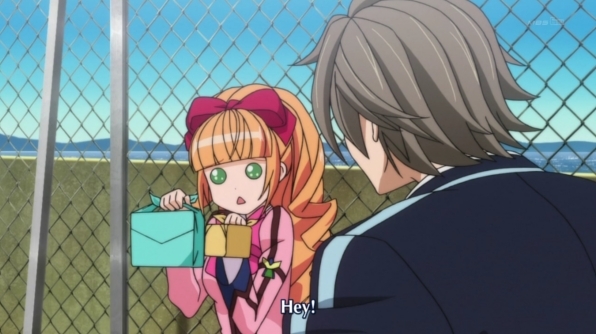 Penguin Himari is not Himari, and there’s no way Himari would put Shouma’s life in danger. And why does SG call Penguin Himari “Mario?” And on a thematic level, do the three floors Kanba stumbled down to reach the basement reflect the penguin numbers? Why Dvorak? Why so loud? When are they going to explain the “95” in the OP? 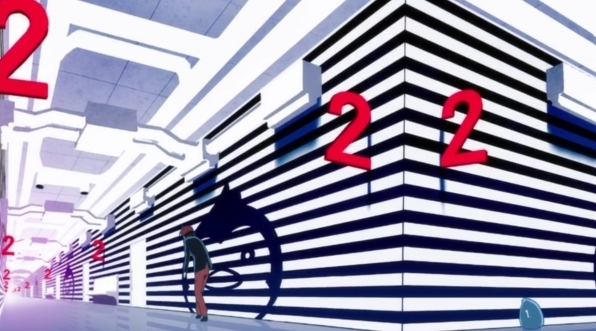 Once again an episode of Penguindrum has so much going on visually that it makes my head spin. Which is one of the reasons I like it so much. I never thought I'd see this. Does anyone know what music they used near the end of Hanasuka Iroha 25, with chorus and orchestra? That music made an already great scene almost overwhelming. While the Kissuiso staff plus Ohana’s mom (and Sui, serving as a waitress) worked frantically to serve their customers at the height of the bonbori festival, it flowed along with them and gave the wildness a feeling of serenity. As it should. For the first time all episode the staff were working together on a single goal, to make the customers happy. 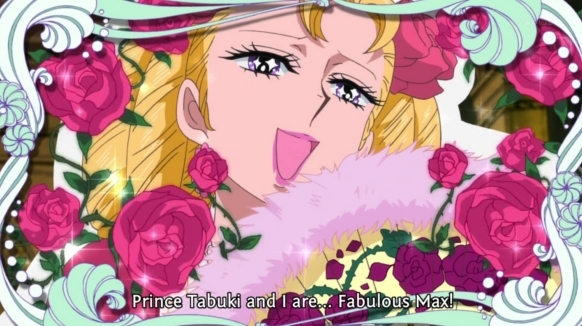 Before that the episode was about conflicting ambitions and dreams. Indeed, the question of dreams comes up a lot. Ohana wonders what her dream is. Yuina wants to go abroad. Minko’s dream is to be with Tohru, at Kissuiso. In her mind there’s no other place for her. Nako feels that not everyone can find their dream, but they can latch onto someone else’s and make it theirs (a conversation overheard by Madame Manager). These thoughts are found between the working and fighting scenes as the threat of Kussuiso still looms over them. To add to the fun, Ohana’s mom shows up to work, and Sui lowers herself (quite happily apart from one dizzy spell) to being a waitress, meaning her weak-kneed son has to boss her around. You have to wonder if by doing this Sui has decided to buy into the dreams that the others have. Everyone’s thoughts and dreams have been so well shown by this and earlier episodes that the final montage with the choral music (It sounds old, not written for the show, but I might be wrong), which kept on through the closing credits, felt like a finale of sorts, but that’s next week. 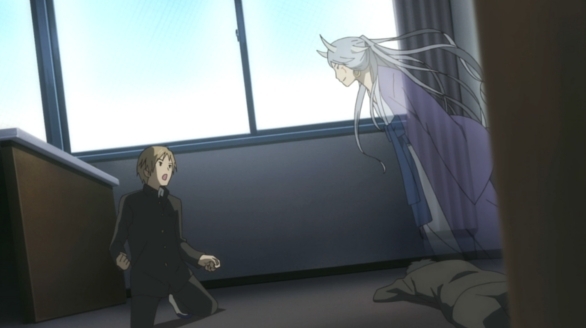 I suppose we’ll have to deal with Ko, and consider what Tohru meant when he told Ohana that she had changed. Ah, I’m going to miss this show. 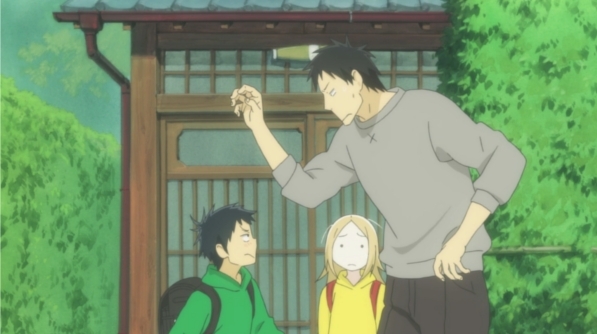 Natsume Yuujinchou San ends soon, too. 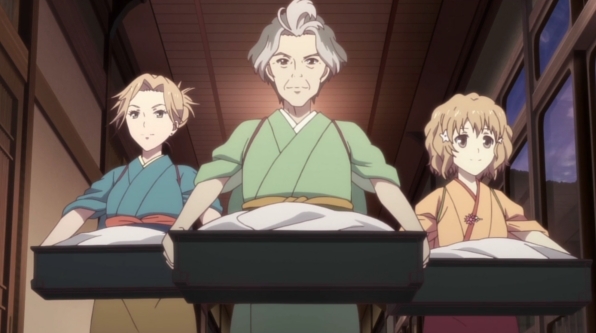 For the penultimate episode Natsume is attacked by a youkai from his past, and as he recovers we see not only the history of the youkai but of his decision to move in with his current guardians. It’s an affecting story; the boy was so confused back then that he first considered Fujiwara to be another youkai trying to trick him. And we see the sad truth of his past. It’s not that his string of guardians didn’t care about him, they just didn’t know what to do with him when he would get all weird. It makes his encounter with the youkai all the more frightening. She senses his lonliness and decides to keep him as a pet, even playing a few psychological games to prey on his weakness. It almost felt like an adult making advances on a minor, and it was disgusting. 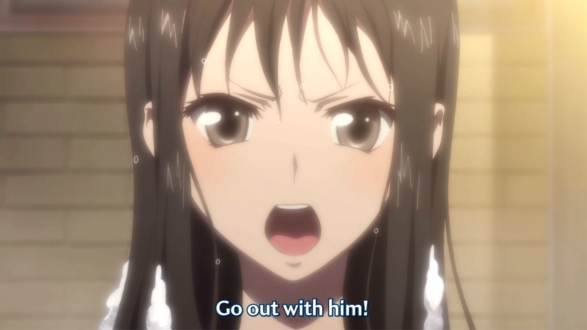 But Fujiwara and her husband actually give him a choice. He can stay with him if he wants to. No pressure. No mind games. 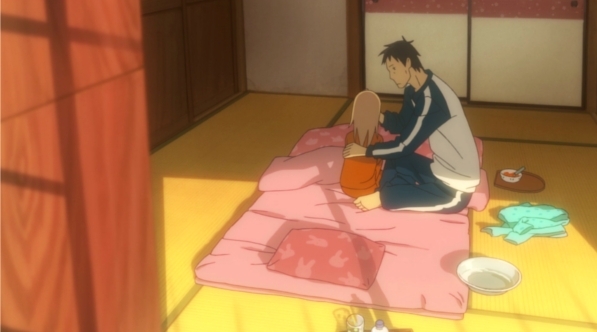 Natsume makes the right decision and, of course, the series has shown us how his life has improved. Next week’s the finale, and it looks to be a party episode, a good way to end the current season. Takako shows Ohana how it's done. 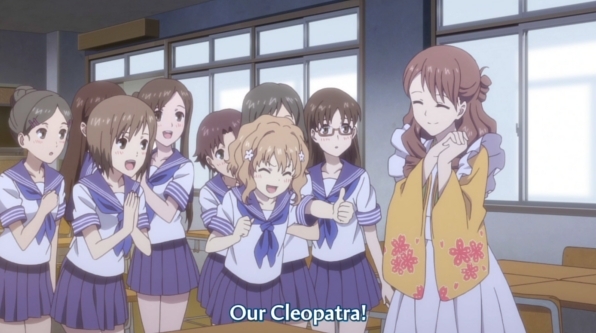 There’s no way to describe the plot of Hanasaku Iroha 23. It moves forward, but in little ways, different characters, different scenes. As usual, most of these scenes are spot-on, gentle humor undercutting when things are about to get too maudlin. What I found most interesting was Ohana’s new, fumbling relationship with a woman who, rather to the surprise of both of them, is now her aunt. 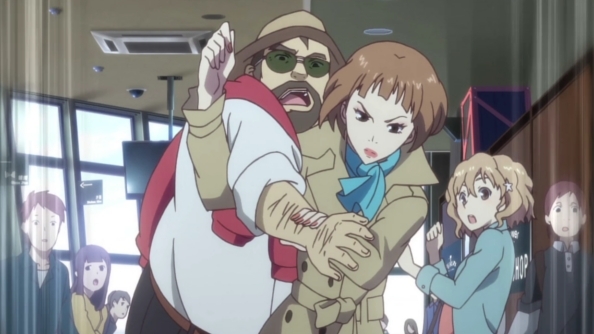 There’s plenty to dislike about Takako, but, as Ohana finds out when she body-slams the deadbeat director (with the lovely touch of the cellphone playing a tinkling “Ride of the Valkyries”), she has some admirable points. I’m less thrilled with the whole Ko situation; I thought the two of them would have moved on already, but I’ll grant that the scene of Ko and Ohana’s mother watching the “movie” footage was touching (and again, undercut with humor). The encounter at the footbridge was a bit much, though the evening lights coming on (Ohana’s favorite time of day in Tokyo) was another lovely touch. Okabe's got his mojo back. I long ago lost track of what happens in each timeline of Steins;Gate, or what the alpha or beta lines signify, or who is whose dad. And I don’t understand why Okabe had to see Kurisu die first. As for all those failed attempts at rescuing Mayuri, I guess he had to undergo that to get to where he is now. Maybe. This takes away a little of the interest for me, but only a little. 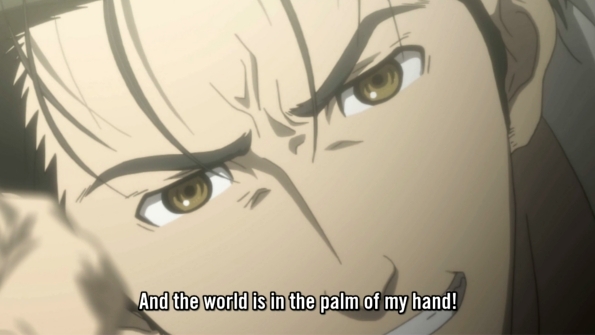 For over half the season now the show has really been about Okabe trying to save the people he loves. And now he might actually have a way to do it. His triumphant mad scientist declarations and laughter at episode 23’s end was wonderful to watch after so much failure and dread. So I don’t care if the finale won’t make any sense! Go, Hououin Kyouma! Proceed with Operation Skuld! 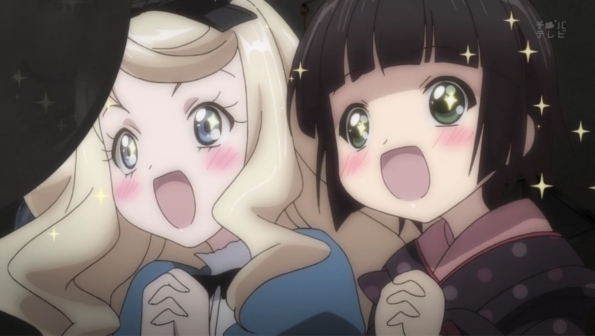 Ikoku no Meiro Croisée takes the idea of things being there because you want to see them and presents them through Yune’s eyes in two ways. One is the fabulous slide projector and moving picture toys Oscar finds in the storeroom which not only amuses delights Yune but Alice and a store full of locals as well. I’ll ignore the fact that certainly Alice ought to have seen one of those before—I’m a little surprised she doesn’t own one. The other use involves Claude and his father, sadly gone, and Claude’s inability to compare his work to his. We see the father through Claude’s eyes, and through Yune’s, another thing you see because you want to. So the metaphor goes, and so the episode. One thing I’ll say about Kamisama no Memochou 9: at least Alice’s Eddie Gaedel tactic wasn’t the reason they won the game, I mean, just give up first to a tiny girl who can’t run that fast, or rather, to the cheerleader who pinch-ran for her. Instead they gave us an A.J. Pierzynski which, er, is almost as stupid. Naruma knowing that the 21st pitch would be a forkball was almost as bad. A stampede for the climax is never a bad idea. 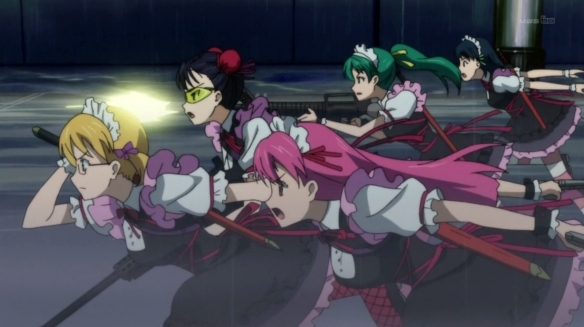 The Idolm@ster 8 feels like a movie comedy. It starts with mistaken identities and a valuable ring, adds goons, sidekicks, strangers, zoo animals and an oil tycoon, throws in searches and chases and ends with a stampede before everything gets sorted out. It could have gone farther with the craziness but as it is it’s pretty fun. This show is no masterpiece but it it continues to entertain above its roots. 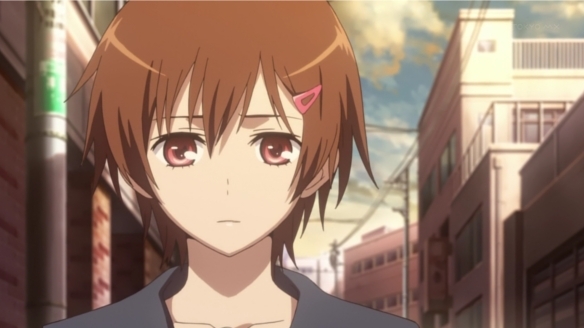 And once again, Makoto shows herself to be the coolest girl in the series. Watch her kung-fu on a ladder! Swoon as she slings ham and flings crockery! 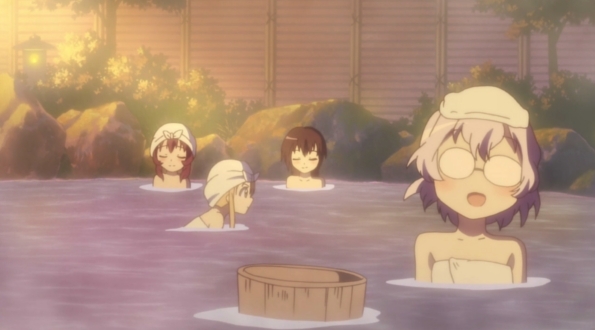 Yuru Yuri takes some of the girls to Kyoto on a school outing, where they stay at a Japanese style inn with a hot spring. It’s mainly Kyoko running around like an idiot while Yui acts as the straight man, Ayano as the angry bystander, while Chitose nosebleeds a lot. Points deducted for not covering the following hot spring inn clichés: ping-pong, drinking milk, vibrating chairs and ghost stories. 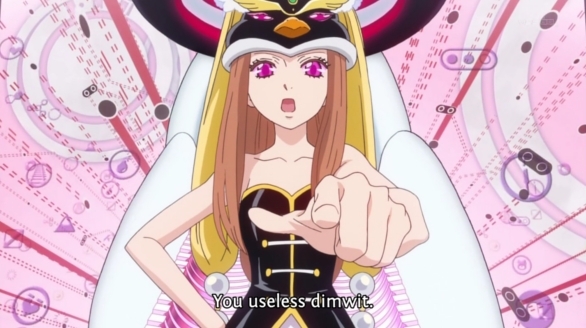 Mawaru Penguindrum 7 continues with the sad and desperate Ringo story arc, which only gets worse, and buries us with another truckload of visual quirks that either have profound meaning or are the workings of my cold-addled head, I can’t tell anymore. But I will say I’m getting a little tired of Ringo’s story. In this episode they take her obsession and stretch it until she has only one course of action left. On the other hand, the whole thing is so much fun that I still watch, grinning, usually. I don’t particularly like Ringo. I admired her when she punched Penguin-Himari, but that was because she was rebelling against an unfair situation, something the boys cannot do—granted, they have a compelling reason. But her obsession is liable to hurt a number of people and she doesn’t mind, because she has her own version of “fate” on her side. So I get enjoyment watching the oblivious Yuri defeat her again and again, finally through engagement to Keiju. We see this through Ringo’s POV; Shoma is just along for the ride, meekly tossing in the odd “Why don’t you give it up, already?” and undergoing her bizarre plan to create an aphrodisiac by having a toad spawn on his back. (His penguin eats the eggs; what that is THAT supposed to mean? For that matter, what was the point of taking one bite out of all the sandwiches? What is the food metaphor? I DON’T KNOW!) I can’t say I’m crazy about Shoma, either. So far all he’s done is meekly agree to whatever plan the other person has … for Himari, he tells himself, but his brother is more proactive at this. Alas, Kanda’s upcoming struggles with slingshot girl are still in a holding pattern. All she needs is the laugh and we got Namami here. Happily, Ringo’s POV is an imaginative one. And the show’s “real” moments aren’t exactly mundane either. 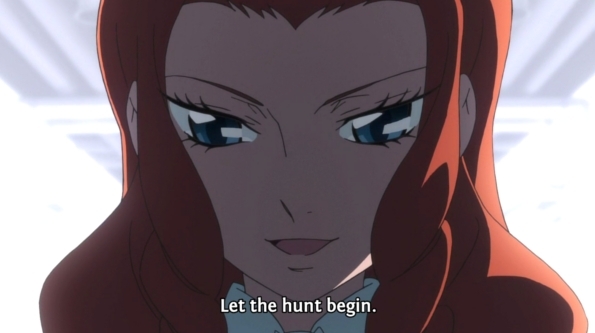 We get another French Revolution drama where the character designs conjure up more Utena flashbacks. 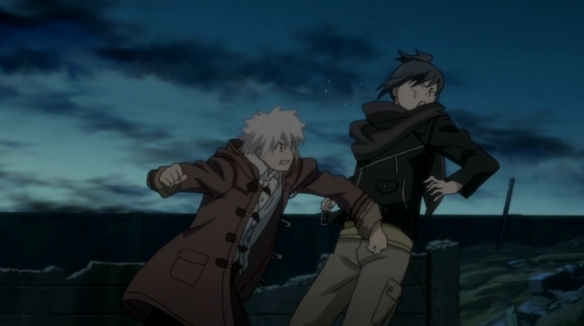 And we get another drama, this time in Ringo’s head. And killer whales. Meanwhile this week’s subway sign message is “Know when to give up.” That and the play title “The Tragedy of M,” is like the real world shouting at Ringo to just give it up, already. Well, she can’t go any farther than she does at the episode’s end, so maybe after they deal with the aftermath the show will move on. 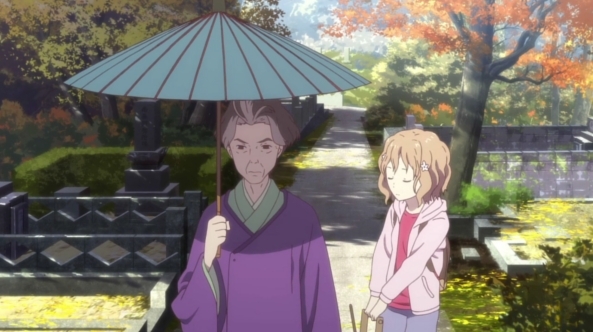 After a two-parter with lots of plot and danger, Natsume Yuujinchou San returns to its usual pastoral ways in episode 7. And we meet up with an old friend, the Fox Kid, living on his own, learning to fight back against the bullies, hoping Natsume will show up again. And he does! There’s little to say about the episode. The key word is time. The rock-guy tells Fox Kid that youkai, humans and beasts all live with different concepts of it, and of what one should do in life as well. We get that reinforced when we learn that Nyanko’s wounds from last week will heal quickly in youkai terms but slowly in human terms. Fox Kid finds a watch, which later breaks. Looking for Fox Kid, Natsume muses that, after all, he has a life of his own. 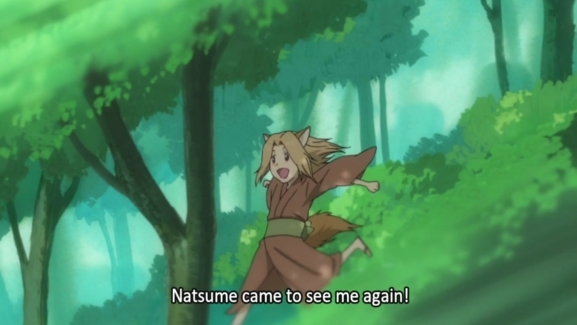 We can play “spot the metaphor” all we want, but its Fox Kid’s desire to meet Natsume again that carries the episode. Natsume is there on different business, and though he’d like to see Fox Kid, he has other concerns which keep them separated. 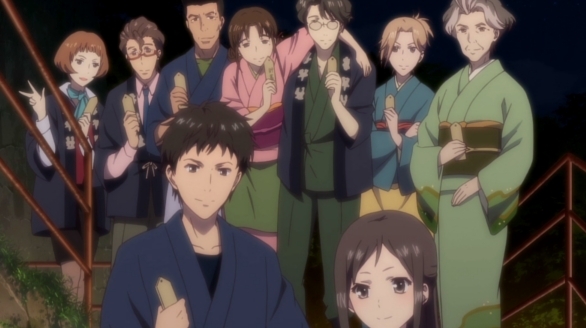 I don’t remember too much about the boy from previous seasons, only that he is devoted to Natsume, which makes his disappointment and frustration sad to watch. And when they do meet it’s at a scene of danger and tragedy. This is where I don’t think the metaphor works. The watch breaks, signifying the end of Fox Kid’s relying on human time, but that suggests that it’s time he and Natsume should part ways forever. That’s not what happens. 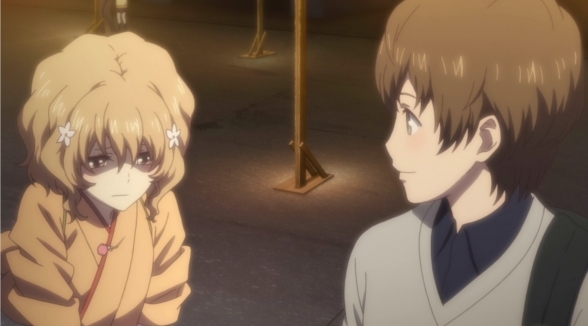 Well, Natsume does eventually leave, but there’s no indication that Fox Kid has changed his mind about him. Mixed reactions to the marriage announcement. 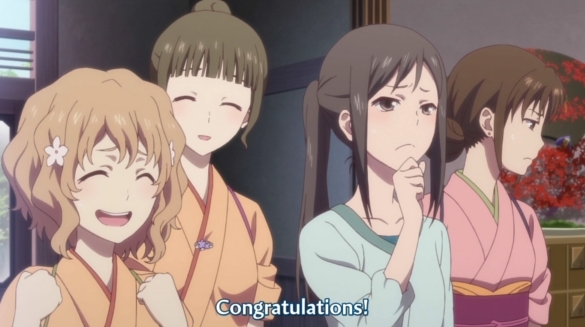 I’m not sure of all the subtleties in Hanasaku Iroha 21, the relationship between wedding receptions and inheriting the inn, etc, but the main points are clear. Enishi and Takako, the two most idiotic characters in the series, are getting married. I smiled, because I knew that this would send everyone off in one tizzy or another and that we’d cheerfully jump from one to the next, with little slice-of-life asides thrown in. And that’s exactly what happens. Minko has officially stopped making sense. The most important tizzy involves Sui (well, she’s not the tizzying type), who is either for or against it depending on how you read her face. She is so intimidating that Takako asks out of it all before Sui breaks character and reassures her with a story of how she and her husband formed the inn in the first place. Then she throws the whammy: Enishi and Takako won’t. I can’t blame her at all, but on the other hand, who on earth is going to succeed her? Ohaha? Too young. Ohana’s mom? Yeah, right. What about Tomoe? 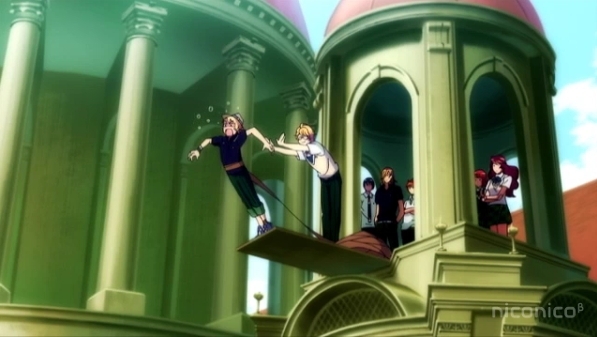 Hmm … There’s no one in the small circle of Kissuiso staff capable of doing it. But all this can’t upstage the sillier tizzy that Minko has when she hears her beloved Tohru praising Ohana a little too much. Maybe because this one brings back Minko’s nasty sideand her insecurities, and includes a naked shower wrestling scene. As for the wedding, who knows if it will go on or not? On one side of No.6 you have the generic utopia/dystopia and its victims skulking around and within it. But now they’re playing up a weirder, mystical story involving peaceful forest people and their goddess, and a song which Rat somehow knows. Some people might find this departure from a practical adventure story a disappointment, but I am so indifferent to its poorly-executed clichés now that I find it a relief. We’re told in episode 8 (the mystical part) in dueling narratives that planners planned No.6 as a utopia, but then they turned bad. No explanation why or how. Who was responsible? Why didn’t anyone try to stop it? And, I guess, ever since then the city has been done the usual bad things, like abducting citizens, stamping out dissent, burning the aforementioned forest people out of their homes, etc. So give me some mysticism. It can’t be any worse than Sion discovering Safu was abducted by finding her coat, I mean, come on! Oh, Sion kisses Rat, and later punches him. Both welcome progressions in their little romance. 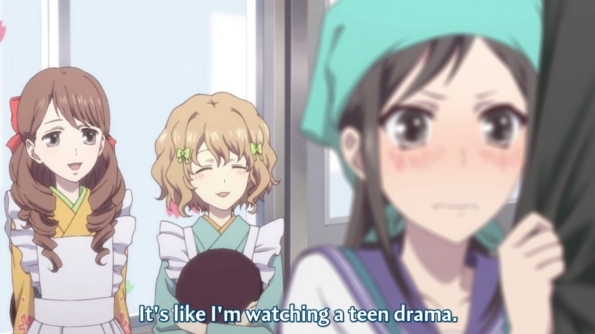 At this stage, part of the fun of watching Hanasaku Iroha is watching it tick reliably along. We know the characters and the way the show likes to present itself by now. All I have to do is sit back and watch new story arcs unfold, confident that the show will not make any serious missteps. Episode 19 works exactly in that way. It’s not just that every character is interesting, but they interact in interesting ways. Take the picture above. In a lesser show Yuina would be slightly spoiled princess of the rival inn, and she is here, too, only she is also great friends with the Kissuiso staff. And maybe because she can act like a pampered princess but still get dirty with the other girls, they take her affectations as part of what she is and have fun with it. And in terms of the show itself each character is not only allowed their affectations but are permitted to bounce them off each other at random. Listen to me; I’m acting like the characters are actual human beings. 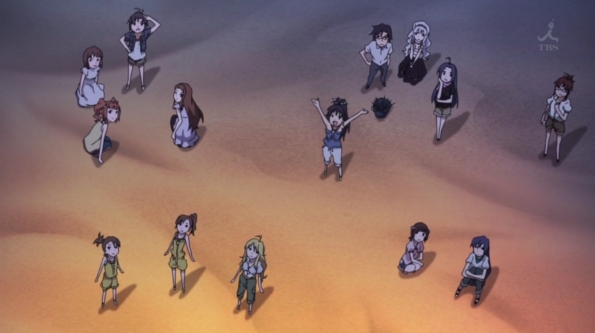 In ep19 we see countless bouncings-off as the girls prepare for the school festival. 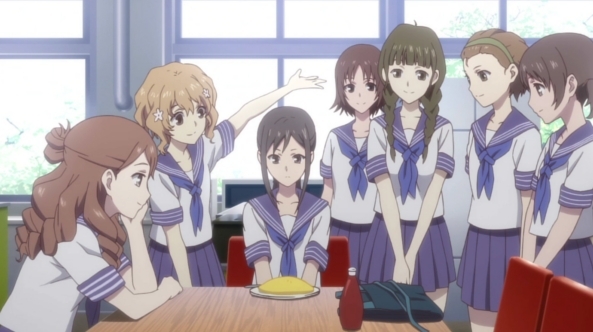 We jump from Ohana to Minko to Mako to the kitchen staff to whoever, (not to mention Ohana’s strange little dream) and back again, and every quick little scene has something good in it, even if it’s a little grunt by the kitchen staff, or an extra head-bob from Mako, until we get to this arc’s crisis. 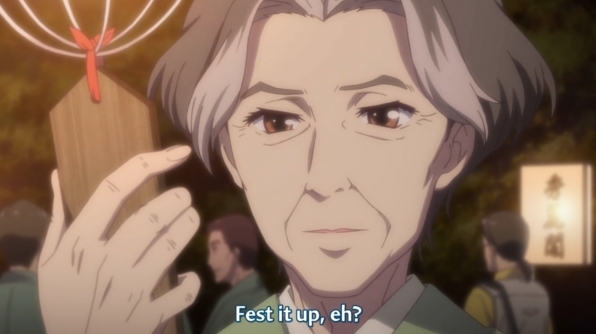 My only complaint about the episode is in Minko’s speech above. Her hypocrisy is so obvious that I’m surprised she herself didn’t stop after that and say, “oh, wait …” And then episode 20 as a whole doesn’t quite live up to the charm of the one before it, that is to say, it’s merely good, not very good. The problem is not only that they have a crisis to fix, but it’s fixed in a facile way. Rinko has rejected omelet rice from the menu not because of meanness, but because it’s impossible to make on the burners in the classroom. So everyone pitches in and they come up with a new version that they CAN make. 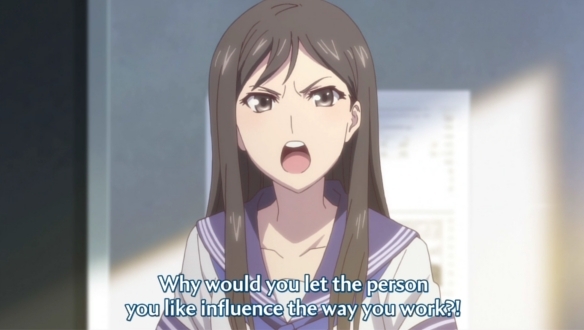 Ironically, this sort of simplistic answer in such a smart show took me so much by surprise that I wonder if the show didn’t do it on purpose as sort of a sucker-punch. So predictable, it becomes unique, or something like that. Never mind. Even with this questionable working out of the crisis we still get a ton of lovely moments. Nako helping the art prodigy Mizuno with her exhibition, which no one attends (but the girls bond), the boy being served an omelet with “Love” by his would-be girlfriend, a scene which is then upped when Tohru shows up, even a bit about the efficient, hardworking union workstaff brought into Kissuiso and how some regulars miss Ohana and Nako. And if you’re still a little bummed about the “let’s all work together” bits, I say again that I suspect the show is fully aware of what it’s doing.